It's Your Last Chance to Cash in on the Extravaganza Sale and Special 24 Hour Doorbusters TODAY ONLY!!! SEE ALL EXTRAVAGANZA SALE ITEMS AND DEALS TO 50% OFF! #118491 Clear Block Bundle (Blocks A - I). Retail $66.95. Today Only $53.56. #120279 Clear Block Storage Caddy (helps keep blocks organized and scratch-free--I leave it open in a drawer for easy access). Retail $16.95. Today Only $13.56. Contact me by e-mail -- gbarron56@comcast.net, if you need assistance placing your order! Otherwise, visit my online Stampin' Up! Store to place your order! HO, HO, HO ... It's the ControlFreaks Christmas Blog Tour! Hello everyone and welcome to the Control Freaks November Blog Tour! This month is all about Christmas! If you're arriving here before 8 pm, some links may not be working yet! Please come back in just a bit if you run into a road block! If you've already begun the tour, then you must be arriving from the blog of LeeAnn Greff. She had some amazing projects for us! I decided to create a gift duo for the tour this month, using the Snow Festival Designer Series Paper. The circular gift box is so fun and really big as well -- it measures 5.5" tall with a diameter of about 4" -- big enough to hold a beautiful scarf, a pair of gloves or even delicious homemade cookies! We don't want to bog down the tour with extra pictures and details right now but never fear! Come back in a couple of days and I'll post some additional pictures and directions for making this project! Stamp sets include French Foliage (for the fabulous poinsettia). I used the Big Shot with the Apothacary Accents Framelits and the Window Frame Framelits as well as the Large Scallop Circle Die. The poinsettia leaves are stamped in Cherry Cobbler ink on Pretty in Pink Cardstock, coated with Versamark and Iridescent Ice Embossing Powder and then heat set. They are so sparkly and beautiful in real life! The final embellishments include Basic Pearls and 1/2" Seam Binding Ribbon. That's pretty much it! This project looks a lot more complicated than it really is! Try it ... you'll definitely want to make more than one! Thanks for much for stopping by! I hope you enjoy the tour and I hope you'll be back soon for more ideas and inspiration! It's time to move on down the road now to the blog of the always amazing Wendy Weixler (love ya, Wendy!) Just click on the image below and you'll be magically transported to the next stop! Hello everyone! I have a card chock-full of TEXTURE for you today! It's also a Christmas card which uses a surprising stamp set -- PENNANT PARADE! Now, you would usually think of Pennant Parade for a birthday or celebratory card ... but for CHRISTMAS? Yep, turns out those little pennants, when inverted, make AMAZING Christmas trees. Who would have thunk it? I included lots of texture on this little card with three different Embossing Folders. Using the Big Shot, I combined the Perfect Polka Dots, Tulip Border and Winter Flurry embossing folders. I just love the suggestion of snow that the Polka Dots add to the trees. The color combo is a little unconventional for a Christmas card but I love that as well -- Pacific Point and Gumball Green! The sentiment is from the Curly Cute stamp set. The trees are all stamped, with the exception of the single middle tree which is punched with the coordinating Builder Punch and embossed and then embellished with Basic Rhinestones. Please Note -- it's import to stamp all the images BEFORE you emboss with the Polka Dots. As you can see, a little stamping on the inside of the card finishes it off perfectly! And here's the really great news about this card! As part of the Online Extravganza Sale, you can purchase the Pennant Parade Stamp set along with the Coordinating Builder Wheel for an amazing price of just $15.87 (wood mount) or $12.87 (clear mount). WOW -- that's a whopping 40% off the regular price! Click HERE to learn more about the Online Extravaganza Sale! Stop back tonight after 8 PM to hop on the November ControlFreaks Blog Tour -- it's all about Christmas! See you then! It's Stampin' Up's! Once-A-Year Sale -- Online Extravaganza! Hello Stamping Friends! Beginning today and lasting for 10 days only, it's the fabulous Stampin' Up! Online Extravaganza with savings of up to 50%! For today ONLY, you can get the Big Shot, Big Shot Doctor's Bag and the Simply Scored Diagonal Plate on sale! On Wednesday, there are additional one-day deals on clear blocks and clear block storage! Other sale items include Designer Series Papers, Stamp sets, textured embossing folders, embellishments, the new tabletop paper cutter, punches, bundles, MDS2 and so much more! Discounts range between 20-50% -- AMAZING! Click HERE to view the complete PDF with all sale prices! 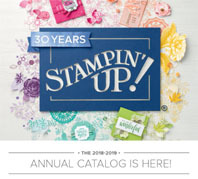 Visit my online Stampin' Up! store to view all the items and place your order. You can also reach my store by clicking on the shopping mouse in the right side-bar of my blog. As always, if you would like assistance with your order, call me or e-mail me at gbarron56@comcast.net and I can help you or answer any questions you may have. Remember, this sale only last for 10 days. Happy shopping! Hello everyone! Yes, I know it's been awhile (again)! Is it just me or is time just flying by? It's downright frightening how quickly the days and weeks slide into each other! But there is nothing frightening about this little guy ... isn't he something! And just in time for Thanksgiving! I found his cousin created by Rae Harper on Pinterest. Of course, I had to tweek hm a bit to make him my own. I cut the Top Note out of Crumb Cake Cardstock, penned on the mouth and stitches details and then embossed his face using the Square Lattice Embossing Folder and the Big Shot. I think the texture looks a little like burlap. Other than that, I mostly followed Rae's lead. I used the Orchard Harvest Designer Series Paper and fabric. Such fun! Well, that will do it for this post. I promise it won't be so long until you hear from me again! Thanks so much for stopping by and I do hope you'll come back soon for m ore ideas and inspiration!